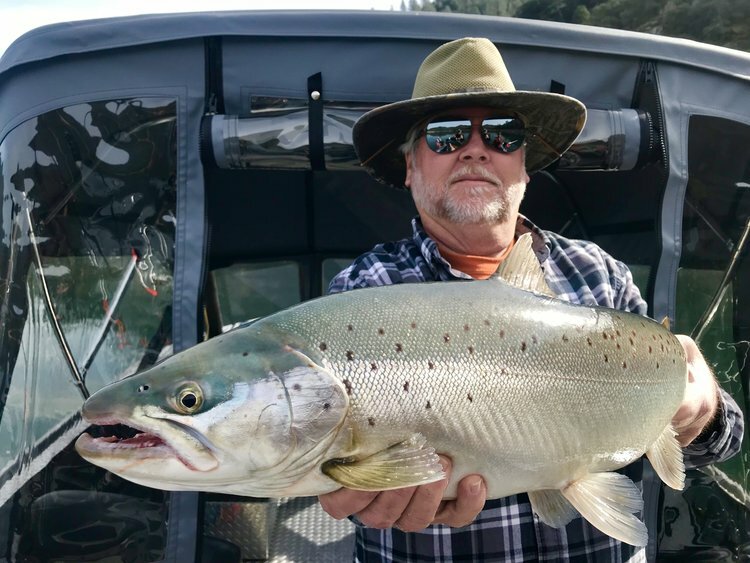 Multi-pound brown trout are not easy to catch, but there are a few tactics you can use to consistently catch these monsters in Shasta Lake and other lakes that hold these amazing fish. I'm going to start off this article by telling you all that I am far from being the best angler to ever guide on Shasta Lake, and I will be the first to admit that there have been many guides on Shasta Lake throughout its history that were excellent anglers and were very good at what they did for their clients to frequently put them on some great fishing. Sadly, I never met any of the iconic old-timer guides, and never had a chance to pick their brains about the fishing on Shasta Lake back in the good old days. 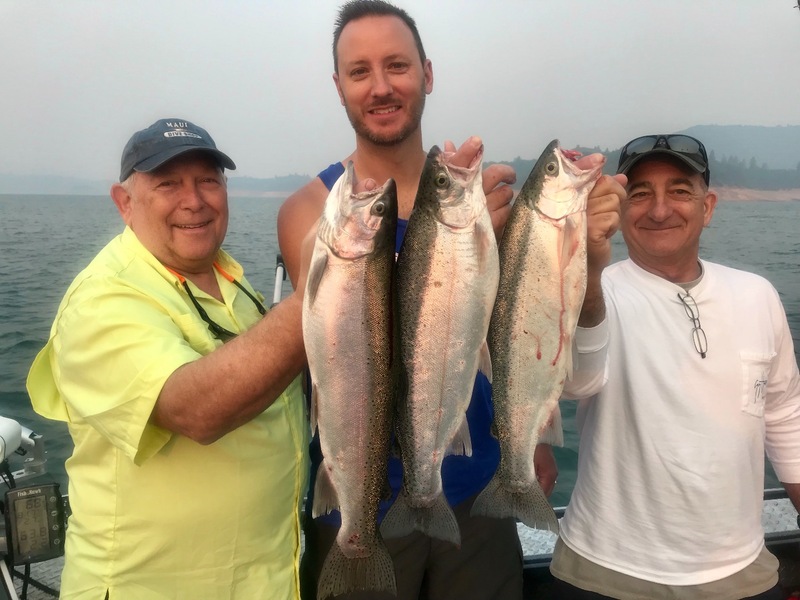 There are still a few long time anglers around, like Stan Kulak who owns Trinidad Tackle in Lakehead, Ca, who have provided some fishing history on Shasta Lake and have given me a few of the keys to unlocking the great fishing on the lake, especially where it pertains to big fish. 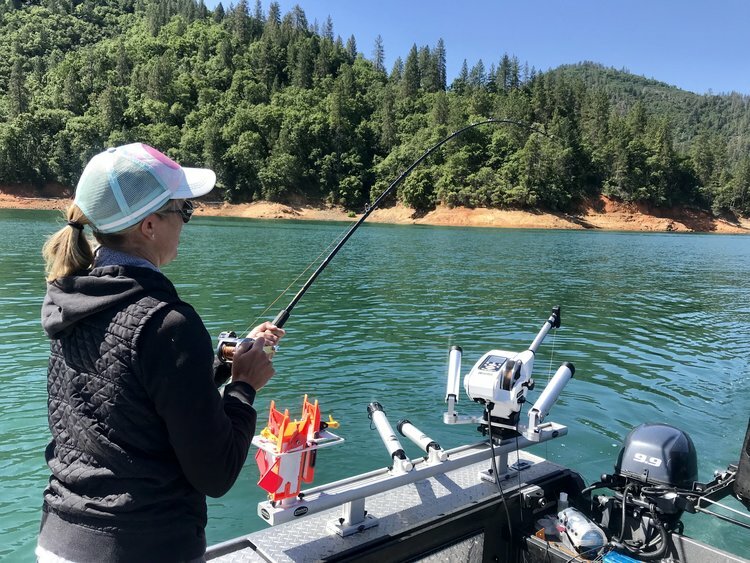 I've spent countless hours looking at different ways to fish Shasta Lake, and, although I haven't invented anything new, I've learned how to use several different methods to get my baits in front of the bigger fish Shasta Lake holds. Most anglers out here in the west have a set or two of downriggers on their boat and that's the extent of their equipment used to get their presentations down to the fish. I've identified several ways to accomplish the same thing, but with several other pieces of equipment. 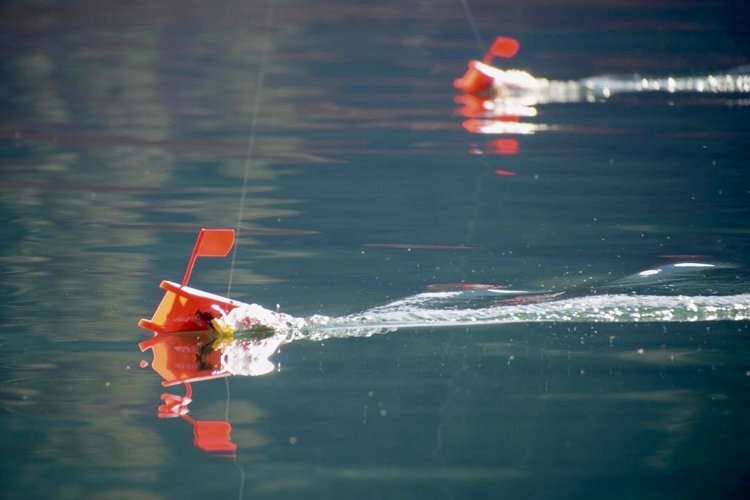 To cover all of the seasons on Shasta and the different water conditions throughout the year, having more than a set of downriggers on your boat is critical to your big fish success. Some of the techniques I'm about to mention are fairly difficult to deploy, but they are all tried and true techniques, that given time, will produce some of the biggest fish you'll ever catch. I'm not going to explain how to use every technique in this article or even tell you when they work the best, I'm just going to tell you what they are and why I use them. I will, at some point, write about each of the techniques and give some detailed information on just exactly how to use them. In the meantime, you can study these techniques online, or by reading content elsewhere that goes into more detail about using these methods to catch big fish. So fall has arrived and Shasta Lake has turned over because of the much cooler conditions making for similar temperature conditions throughout the entire lake. Turnover signals the big (adult) spawners to turn into the pre spawn mode and most will begin their migration up the arms of the lake. I'm not saying you won't catch trout down in the main body of Shasta Lake in the fall, but I can tell you that you won't catch very many. If you want to catch big fish, head north. That's where the big fish will be. October can be a frustrating month to fish, so if you need to take a break on Shasta, October is the month. Now that Shasta is pretty much sitting in the mid 50's temperature-wise, it's time to break out the side planers. The big trout will be in the top 10' of the lake and will be cruising up the lake arms towards the headwaters. Sure, you can use 150' - 200' foot setbacks off your downriggers or by top lining, but your boat is going to spook more big fish than not. Big fish, especially browns, are quite weary of boat traffic. Driving over them will push them to the sides of the boat, so why not have your trolling gear out there where they are swimming off to? Makes sense, doesn't it? The side planers are going to make little noise and their surface disturbance is minimal. During windy/choppy conditions, the side planers will impart action on your lures that's just not possible while trolling with downriggers are fixed rod holders. Lastly, you can cover a lot of water if you have lures off to the side of the boat instead of just running a few lines right behind the boat. As fall progresses into winter, you will have access to the big fish migrating up river, spawning, and out migrating again down into the lake. During winter, I will catch both pre spawn and post spawn fish in the same day. 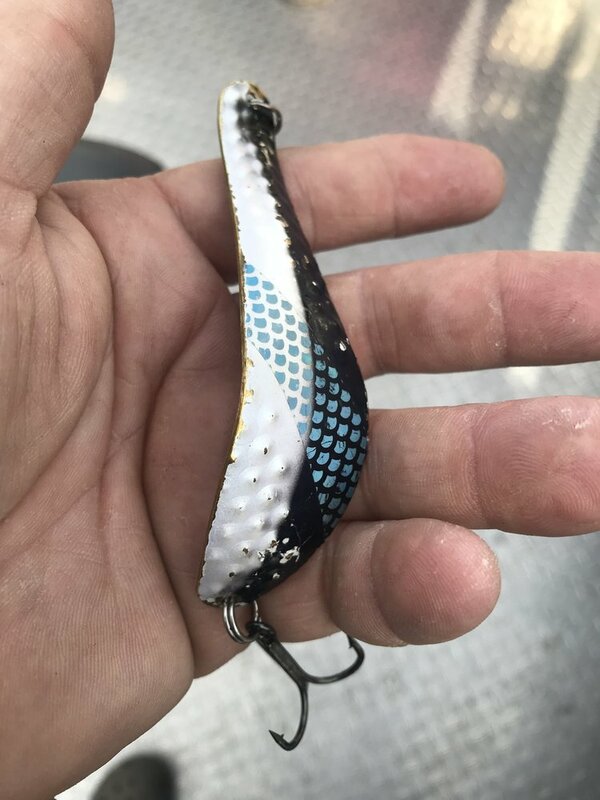 There's quite a few fish around and with the combination of trolling with a spread of side planers, and big fast running spoons like the Trinidad Tackle Optimizer spoon, you can cover tons of water during your day on Shasta and will attract some big bites! 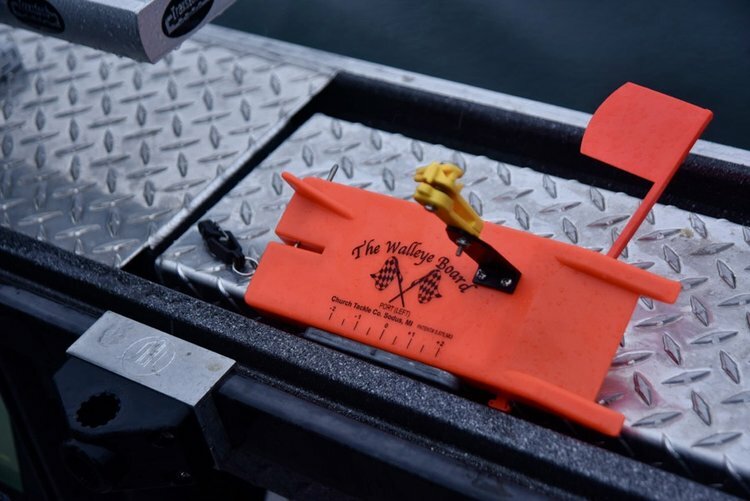 Side planers and even stern planers can be a deadly tool that can be used in many ways with several other items to make them even more effective and to help you cover more layers on the lake. The only thing to consider when deciding on trolling depth in the winter is the presence of cloud cover and surface conditions. If it's overcast and choppy, fish high. If it's sunny and flat, run a few lines down to 10' as the bigger fish will push down a bit to get out of the penetrating rays from the sun and the predator birds overhead. Shasta, often times, gets some great weather in the cold water season, but really, the fish will still be up higher in the water column most days this time of the year. As winter turns towards spring, Shasta will once again start to play tricks on you. Sunny calm days and traveling fish can make for a tough day on the water. One tactic I have come to rely on is to not only work open water, but work the shorelines as the water begins to warm with the spring time sunshine when we tend get it. The browns will move towards structure and will oftentimes sun themselves along the warmer shoreline areas, especially where structure is available. When trying to cover both deep water and shallow water near shore, there is no better technique than running side planers. You can cover both areas at the same time, whereby increasing your odds of finding fish dramatically. Spring brings a little more predictability to the big fish scene. 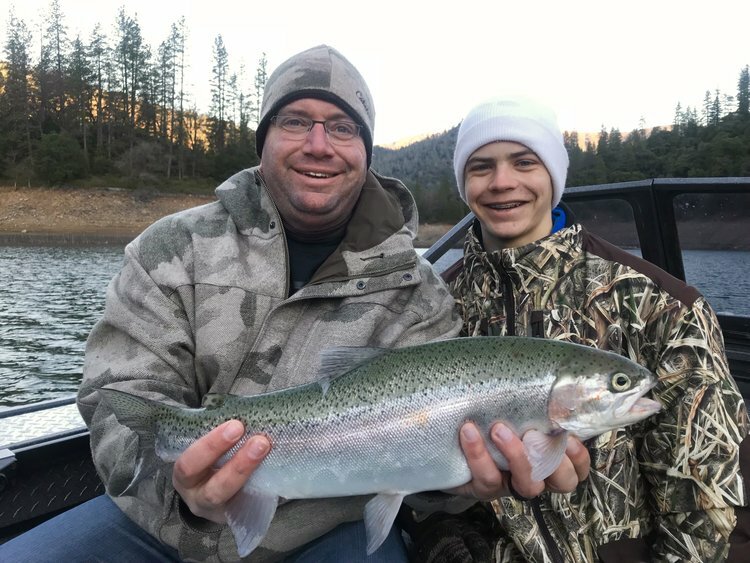 Most of the browns have migrated back to the arms of the lake downstream of their spawning grounds, and the big rainbows are up in the rivers creating the next generation of wild rainbows in Shasta Lake. Because the big rainbows are a rare find in early spring, it's the browns I focus on once again. A good percentage of the browns you'll catch will be near shore, now, especially on big points and rock walls. With more sunny days than not, I find that trolling right on the surface no longer gets most of the bites and I break out the downriggers again. I'll still use the side planers, but I want some baits down a little deeper too. Deeper means 20-30' and if I'm getting lots of bites at those depths, I'll use some line weights to get my side planer lines down a bit as well. Trinidad Tackle makes a system perfect for that technique called Eco Weights. They are a great tool for getting your side planer lines down to the browns in the spring. March and April are my favorite months to catch big browns. They are very active and sometimes, their stomach over rides their weariness, making them a lot easier to catch. They have been back in the lake for a while now, and most have fully recovered from the spawn. These browns have the appearance of ocean run browns and are very brilliant in color and shine. 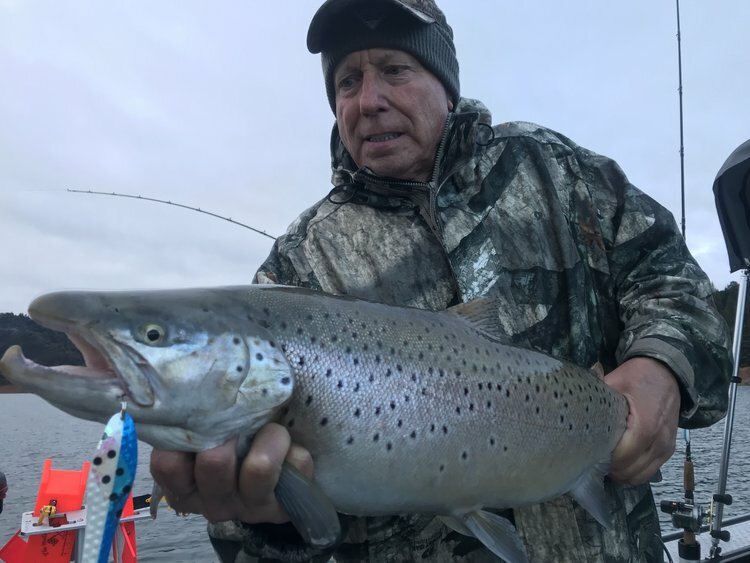 I will concentrate on browns solely during this timeframe, and, with browns over ten pounds caught this year, my calendar fills quickly and the big fish pics are hitting the internet daily. I will let you in on one of my success secrets for this time of the year: When I fish an area I know is holding big browns, I will troll through the areas with big Optimizer spoons at about 3.8 mph. When I work a section of shoreline and don't get bites, but can see the fish sitting down below, I will 'size down and slow down'. I find that aggressive browns will crush big baits trolled fast, especially early in the day. if they are not in an aggressive mood, I know they are in an opportunistic mode and will more likely grafter a smaller bait trolled at a slower speed. As May approaches, the browns will begin to move again towards the main body of Shasta Lake, which can present some challenges when fishing for them. The good new is that the big rainbows are finishing up in the rivers and will be out migrating downstream making for another big fish alternative. If you've pounded the shores for browns and come up empty, push out over deeper water and you may be surprised when your side planer gets slammed and your reel starts to scream! The big rainbows are back and they are on the surface again over deep water. Focus on the open areas of the lake at the entrance of the arms like Dry Creek, Big Backbone, Waters Gulch, and where the McCloud meets the main lake near Bridge Bay. I will often use a number of techniques to get my baits away from the boat because these rainbows will, once again, be high in the water column. 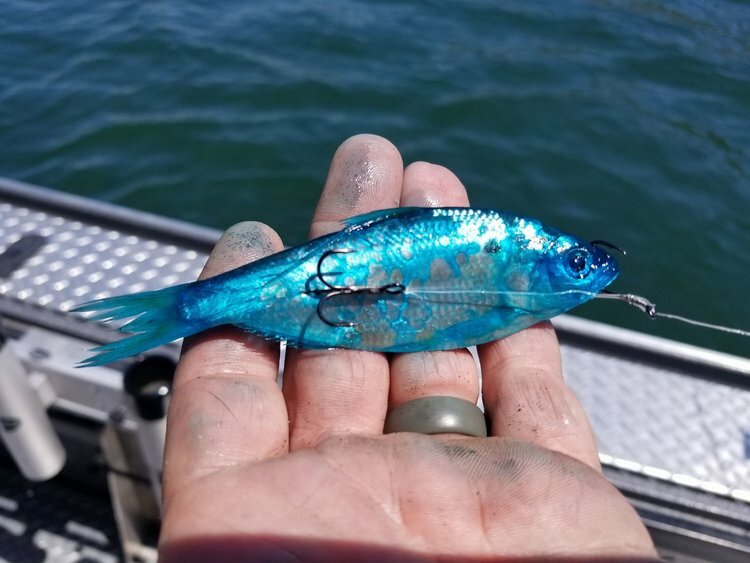 Big spoons, small spoons, and stick baits from Bay Rat Lures are a good bet this time of the year. I like to troll a bit slower for the rainbows and find 2.5 mph to be a great speed for success. Be prepared for switching it up and looking for both rainbows and browns this time of the year. June continues to be a good month for both rainbows and browns, but the water temps are warming and the Thread fin Shad show up in numbers before their spawn. The Shad like the warmer temps so you will first see them tight to the shorelines where the water temps are the highest. This is the time of year when rolling Shad cured in Pautzke Bait Co. Fire Brine is absolutely deadly! I like to use natural, blue, and chartreuse Fire Brine infused with matching color Fire Dye. Run the shad on a double hook rig, naked or behind a 4" Fish Flash and it's fish on! July brings the official jumbo summer rainbow trout season and it lasts through September when we've gone full circle and are looking at fall weather again. The most important factor to consider this time of the year is the thermocline. It changes nearly every week, starting from the surface to 30' early and from the surface down to 125' by late September. You will find the fish where the water temps are below 65 degrees. That is the top of the temperature range the trout will hang out in when they are looking for shad to feed on. The shad won't go into cold water so the trout will have to come up out of temperature to find them. As the hot summer sun warms the top layer of the lake, the trout and Shad will gradually go deeper and deeper. By the time the trout are down below 80', it's a downrigger show and that's pretty much the extent of my technique for this last few months of the summer. Trolling Bay Rat Long Shallow stick baits, spoons (large and small), or spoon dodger combo's are what I use to catch big trout. The Bay Rat stick baits are a killer lure for big fish, especially browns when trolled down deep. Optimizers and other smaller spoons are very effective too! This pretty much sums up, in light detail, the tactics I use to find the big fish on Shasta Lake throughout the year. Of course, there are tons of fine details to be mentioned, but for the sake of brevity, I think breaking down the specific techniques in other articles would be more informative for my audience. 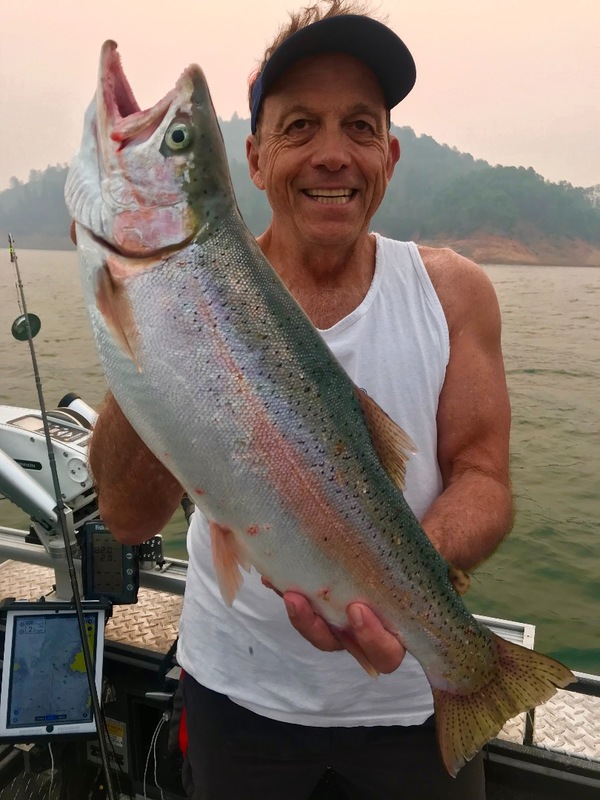 You all see the success my clients enjoy when it comes to catching big fish on Shasta Lake, so take what I've laid out here and implement it into your own strategy when hunting big trout on your own. This is information I rely on, so I know it will help you as well. if you want to get the hands on course, book a trip with me and I'll be happy to share what I know about catching big trout on Shasta lake. Please remember, that these trophy Shasta Lake fish are a precious commodity, so handle them with care if you intend on releasing them. Good luck and tight lines to you all! Big bite on Shasta Lake today! Barely a boat to be seen on Shasta Lake!